In marriage, cooking is a bit like poker. If you produce an ample array of satiable meals that successfully quench the appetites of those you love with many of their favorite flavors, then you are able to throw in a raise here and there. I'll see your stack of pancakes, grilled salmon, brussel sprouts, apple pie, etc... and I'll raise you one artichoke dish. Perhaps this is more like bartering than poker? 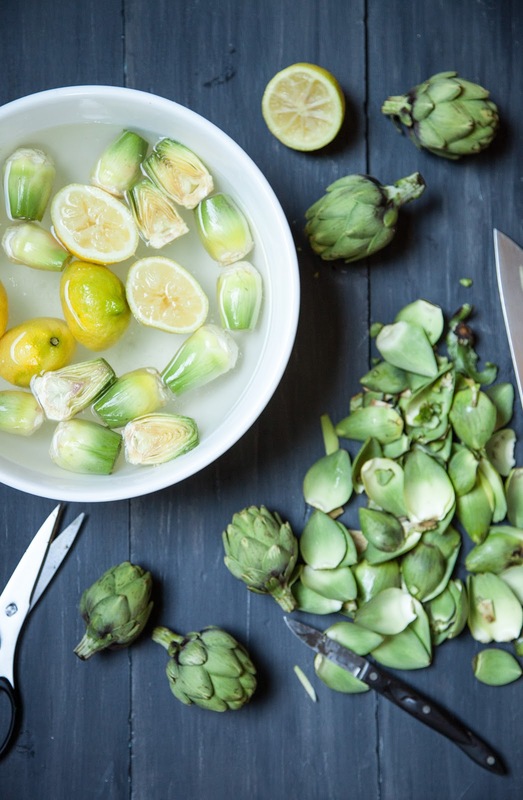 Regardless of the terminology, artichokes are a valued chip in my stack of flavor plays. I adore them... my husband not so much. I love large artichokes steamed and served up simple with a little vegan "butter" or dipping sauce. I love the little marinated ones straight out of the jar. And... most of all... I love the baby artichokes you can get this time of year. With no fuzzy choke to fiddle with and their delectable delicate nature, they are good in so many ways. Sliced ultra thin and served up as a fresh salad with lemon, olive oil and a little seasoning; halved and grilled; roasted; or slowly braised to perfection. Recently we ate at a great little spot called Terra Plata, a lovely restaurant nestled on an unusual triangular block in the Capitol Hill area of Seattle. Literally, its front door is the only door on the corner and the building fans out to a "V" from that point. It is flanked with walls of windows that open to the sidewalk on one side and a quiet little alley on the other, letting in abundant light and the world passing by. It is backed by a group of buildings that make up the Melrose Market, housing Seattle's well-known Sitka & Spruce, along with a handful of fun retail nooks, specialty food spots, and a great little wine bar. We had a number of delicious little plates at Terra Plata, including a braised artichoke starter that literally melts in your mouth it is so smooth and perfectly simmered. While I was able to discern many of the flavors in this dish, there was one that was particularly distinct and unknown to me. When I questioned our server he immediately noted the addition of ground sumac, a seasoning that is not in my everyday repertoire. A minute or two later he returned to our table with a small plate topped with a little sprinkle of this seasoning for us to taste. That was major points in my book. I love it when restaurants (staff, chef, etc) are eager to share their knowledge with you. I didn't want to press my luck and ask for the recipe... so, this is my own little take on Terra Plata's lovely rendition. its starring role. Then I added a couple of olive oil- and lemon-marinated, canned anchovy filets. These get sautéed until they kind of break down into a paste-like consistency. Once this is accomplished, the prepped baby artichokes are added, along with the lemon halves that kept them bright and fresh (more on this later), some kosher salt and ground black pepper, some dry white wine, and some veggie broth. Bring it all to a simmer, cover and let them braise until the liquid in the pan is reduced by at least half and the chokes are delicately cooked through. Then... I sprinkle them ever so lightly with a little sumac fairy dust. Ground/powdered "culinary" sumac is dark red-burgundy in color, has a nutty texture and a tart, sour lemon taste. While used widely in Middle Eastern and Mediterranean cuisine, coarsely ground sumac has such a wonderfully distinct tart and subtly spicy flavor that it truly would be welcome in a number of applications. While I could eat these artichokes straight out of the skillet, with maybe a good chunk of french bread to pull on, I added a 100% whole wheat pasta to a portion of this fixing and topped it with some chicken and a sprinkle of parmesan cheese... a move appreciated by my mate. Whether served straight up as an appetizer or mixed with some other goodies to make a meal, they're a good play. Heat oil in a large skillet over medium heat and add garlic cloves to brown; about 3 to 4 minutes. Once browned, remove and discard cloves. To garlic-infused oil, add anchovy filets and a pinch of crushed red pepper. Break filets up well with wooden spoon as you heat them through so that they dissolve into a bit of a paste. Once this is done, add tarragon, thyme, parsley, salt and pepper; heat through to unleash their aromas. 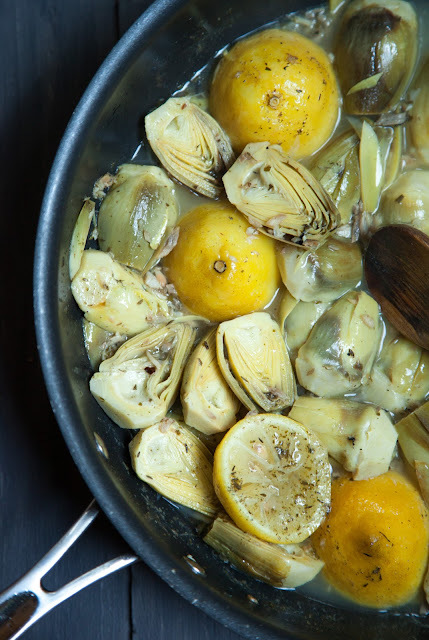 Add drained artichoke halves and all lemon rinds to skillet. Add 1/2 cup wine and enough broth to just cover chokes. Bring to a boil, cover and reduce heat to a light simmer. Braise until liquid in pan is reduced by at least half; approximately 20 to 45 minutes (depending on size of baby artichokes). Season with additional salt and pepper to taste. Plate, dust lightly with ground culinary sumac and serve immediately.